Technology and Design. The Rocky S2V Agonic Mid-Layer Jacket converts to a vest, protects you from the elements and comes with a safety feature. You get two items for the price of one because this is a jacket that turns into a vest. 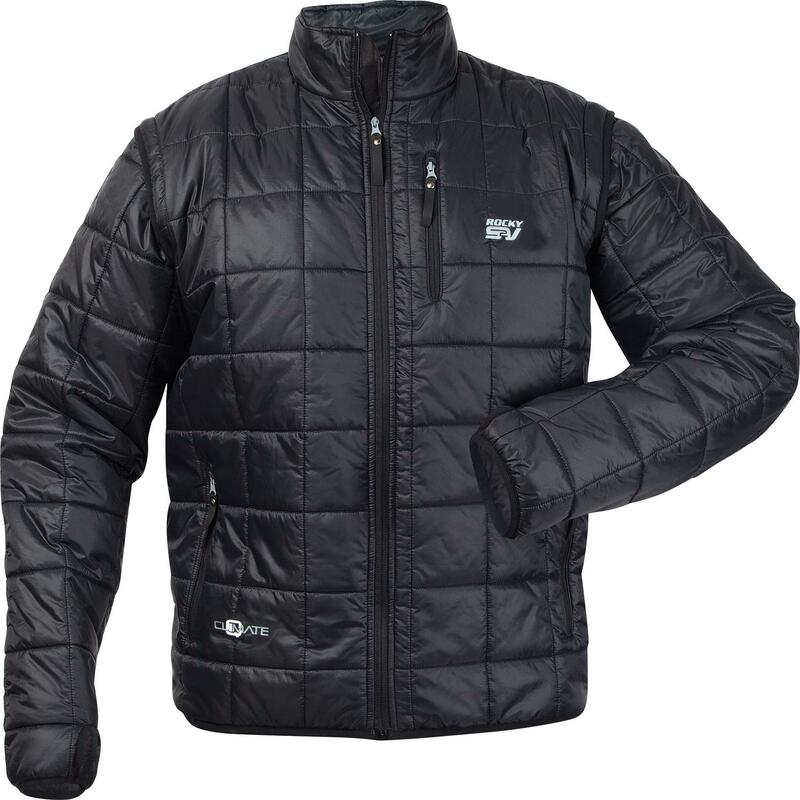 The PrimaLoft® insulation does such a great job at keeping the upper half of your body warm, you can zip off the sleeves; this allows this jacket to be versatile as you wear it through many seasons. This men's jacket is made of comfortable, durable ripstop nylon coated with Durable Water Repellent (DWR) to resist water and keep you dry. This cool jacket provides wind resistance that's enhanced by wind-stopping stretch hem and cuffs. The cuffs also have mobility thumb locks, while the storm collar blocks wind and rain. Though this is a performance jacket, you also get plenty of space to store your belongings. There are pockets at the waist, and there's a unique media pocket to manage your cords. A chest pocket has an internal pocket containing an international signaling strip, which you can use to signal for help in an emergency situation. In addition to all these features, this is a packable jacket. It's a great jacket to pack with you as you travel because it's not bulky and you easily can reduce it's size to fit in a suitcase, overhead bin or that last bit of space in the car. This Rocky S2V Agonic Jacket is the jacket you need for your outdoor adventures; it has the versatility, comfort, warmth and storage you need in your outerwear. It's a jacket and vest in one! And, it looks great. You can't go wrong with this #603615 jacket.